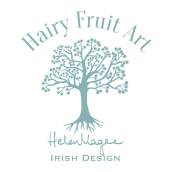 Helen Magee is a fine artist and illustrator from Delgany, Co. Wicklow and a member of the Design and Craft Council of Ireland. ​In 2013 she took a little detour from oil painting and fine art and crept into the enjoyable realm of illustration allowing her the scope to develop her own design brand Hairy Fruit Art, a fun name representing the whimsical side of her personality. Helen grew up in the seaside town of Greystones and now lives three miles up the road in the sweet village of Delgany in Co. Wicklow surrounded by blackberry ditches and fields with grazing animals and inspiring views of the Wicklow countryside. It is here she finds her daily inspiration to create beautiful designs while drinking cups of tea, juggling the laundry and other jobs that naturally arise from being a wife and a mum of two active teenagers. She has a passion for print and surface pattern design and over the past few years has developed pretty collections of wall art, kitchen textiles, greetings cards, illustrated notepads and social stationery. Her designs are not only inspired by the beautiful countryside and local gardens in the 'garden' county of Wicklow but also by memories of childhood family road trips around Ireland, also retro art and design principally from the '60's and '70's when she was like a sponge as a kid and took it all in. Helen also grew up up in a home with a Mum who is a fine artist with a great eye for colour and a natural flair for interior design and her mother still inspires her to this day. Helen is available for commissions and other lovely things. She also wholesales to some gorgeous shops in Ireland. If you would like to stock her products in your store in Ireland or abroad please get in touch.